First Great Western (FGW) has apologised to rail users "for not meeting their expectations". It follows a protest by hundreds of passengers on Monday. They were complaining about late and crowded trains. Some have had a reduced service since a new timetable was introduced in December. In a statement, managing director Alison Forster said the Wiltshire-based company had underestimated the demand for its train services. Ms Forster agreed "too much capacity was removed from the timetable". She said the problems were compounded by difficulties with fleet availability. "We have listened to our customers and increased capacity on the worst affected journeys and are now implementing measures which will further increase capacity," she said. "In the last few days we have started to deliver the correct number of trains for our services. "With the additional trains and with better reliability from our existing fleet we are already seeing an improvement. "Our plans will enable this improvement to continue in the coming weeks." Ms Forster said the company was investing £8m in a new maintenance facility in Bristol and £1m in refurbishing train interiors. 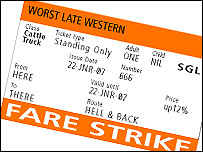 On Monday, train campaigners said about 2,000 rail passengers refused to pay fares in a day of protest over services. 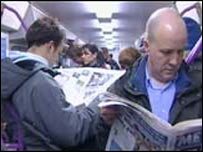 Tony Blair welcomed FGW's improvements in the Commons on Wednesday. "I know, obviously as a result of what happened earlier in the week, there's been a great deal of debate about First Western's services in Bristol. "I am glad that the company have taken some measures to try and address those concerns," he said. The prime minister was responding to Bristol North West MP Doug Naysmith who said: "The situation for my constituents who use FirstGroup's disastrous commuter trains is dire. "The abysmal state of public transport in the greater Bristol area would be greatly improved by setting up an integrated transport system, such as is found in areas with a passenger transport executive." Mr Blair said the Road Transport Bill, due in draft later this year, would improve transport governance in cities, including those with passenger transport authorities. Nearly 900 people have signed a petition on the prime minister's website calling for a reliable train service.